Collins Booksellers - A Way Back from Deep Debt: Debtors Anonymous by Jerrold Mundis, 1230000305216. Buy this book online. 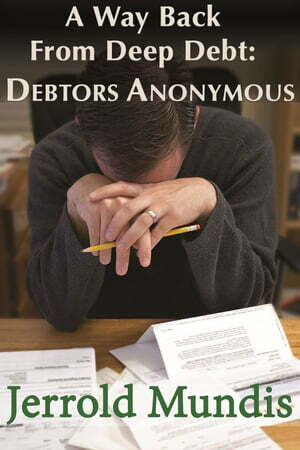 This 3300-word article on Debtors Anonymous originally appeared in The New York Times Magazine. Debtors Anonymous is a 12-Step self-help program modeled on Alcoholics Anonymous that helps its members recover from past debts, negotiate with and pay off all their creditors on a humane and manageable schedule, increase income, and avoid incurring any new unsecured debt going forward. It enables its members to get free of debt and the act of debting and stay free forever, one day at a time. While the subject is debt, the deeper issue at Debtors Anonymous is the quality of life. Becoming free of debt and trouble with money leads to profound changes. Members regain control of their own lives, get back self-esteem, and liberate themselves from fear. Prosperity enters their lives, not just financially, but, for many, in everything from their response to a sunny day to the quality of their relationships. This article explains with examples and quotes from members what Debtors Anonymous is, how it works, what it can do for its members, and how you can participate in it.